After withstanding continual pressure for much of the game, DUAFC edged out table-toppers Lucan FC thanks to a late penalty from Ronan Hanaphy. 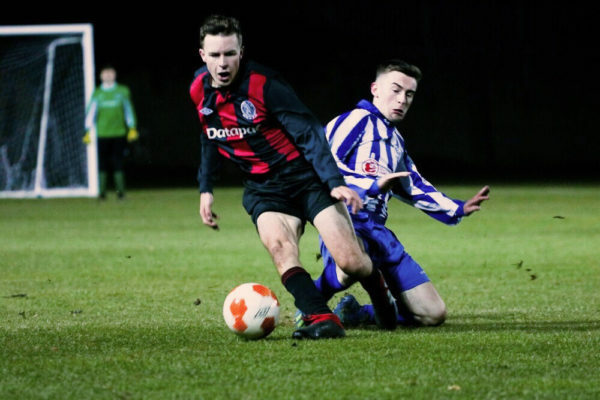 Dublin University Association Football Club (DUAFC) brought to an end a seven-game losing streak in Division 1A of the Leinster Senior Sunday League by scraping to a 1-0 win over Lucan FC in Iveagh Grounds on Thursday. After surviving a barrage of pressure from the visitors for most of the game, DUAFC emerged with a badly needed three points courtesy of a late Ronan Hanaphy penalty. Trinity began the game firmly camped in their own final third, with Lucan unambiguously the aggressors. They moved the hosts’ defence from one side of the pitch to the other, dominating both ball and territory. DUAFC’s midfield players were left with little option but to forgo any attacking ambitions and join their defenders in two banks of four in front of the penalty area. The opening 20 minutes were an exhibition in bodies-on-the-line defending as Trinity threw themselves in front of every Lucan effort. In a rare foray into the opposition half, DUAFC captain Ronan Hanaphy spotted the Lucan goalkeeper straying from his goal line. With quick wit, he floated the ball from thirty yards and looked on in agony as it landed plump on the crossbar and bounced away to safety. This was about as good as it got for DUAFC’s front players, and the first half ended much as it had begun, with Lucan’s possession negated by Trinity’s defensive work rate. Very little changed after the break, with Lucan asserting their technical dominance over Trinity, who were more than happy to soak up the pressure and wait in the long grass for an opportunity to launch counter-attacks. Goalkeeper Owen Lindenfeldar was called into action on multiple occasions, pulling out some top-class saves to keep the game scoreless and frustrate Lucan further. After 80 minutes of dogged resistance, Trinity’s chance eventually came. Lucan left themselves short in pursuit of a decider, and Hanaphy, perennially the danger man, slalomed through the middle of the park. He linked up with Oisin Pennycook and Brian O’ Reilly before the latter was brought down in the area. The referee duly pointed to the spot. Hanaphy’s initial shot was saved but he was quickest the rebound and slotted it home. It was a killer blow for Lucan, whose stolid possession and profligacy had come back to haunt them. It was a hard-earned three points for Trinity, who owe it to a back four unit that kept their concentration for the entirety of the game. With three games in hand at the top of the table, it looks likely that Lucan will be Senior Division 1A champions. After seven defeats on the trot, DUAFC will be delighted to claim such a big scalp, and with plenty of games left in the season they have plenty of time to get back to winning ways and climb out of mid-table’s lower reaches.